Schools are a breakout market for the Magic Planet, first sold to NASA and to museums. If you want to know how Global Imagination is positioning itself as an indispensable educational tool in the US and Chinese market, you can read the full article in the InformationWeek site. EdTech DIgest has recognized the Magic Planet as one of the coolest, most effective classroom tools of 2014. For more information, you can read the full article on the EdTech Digest site. Stockholm University educates students from Kindergarten to grade 5 on climate change using interactive activities on the Magic Planet. For more information view the original article (in Swedish only) here. "Trying to locate elementary school teachers who ha"
"Just curious, how is Mascotti using the Magic Plan"
Bigger. Brighter. The Magic Planet pedestal system is free standing and offers the choice of three globe sizes: 24” (61 cm), 30” (71 cm) and 36” (91 cm). It’s ideal for brighter locations and larger rooms. You can roll it around the school campus with ease, so it can be in the classroom for lessons or in the library for enrichment at other times. It delivers value all day every day. 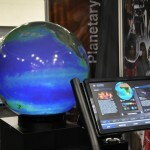 Global Imagination is the world’s leading supplier of digital video globes. Our product, the Magic Planet has been proven to increase comprehension across a broad range of K-12 subjects, as well as to increase class participation and collaboration. © Copyright 2017 Global Imagination. All rights reserved. Global Imagination and Magic Planet are registered trademarks of Global Imagination, Inc.